The Serval is a slim and beautiful predator that lives in the bushy savannas of Africa. This cat is a very capable hunter, able to catch low flying birds, catch fish in the water and pick small mammals out of their caves. 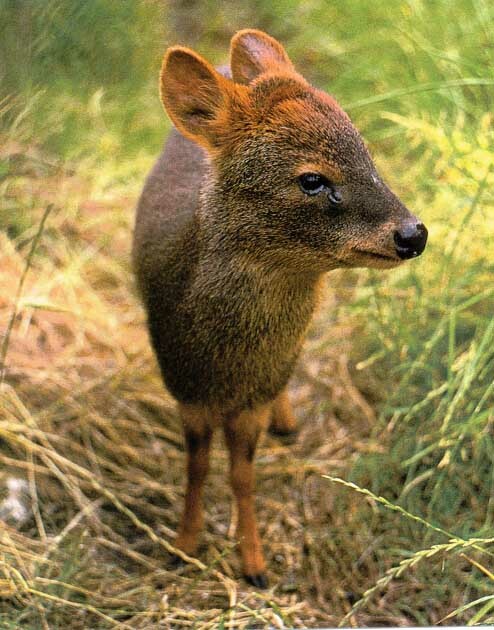 They inhabit all territories in Africa south of the Sahara desert, except for the rain forests and arid deserts. Servals have elongated bodies and reaching only one meter in length, they’re classified as small cats, as opposed to lions, tigers and other large cats. 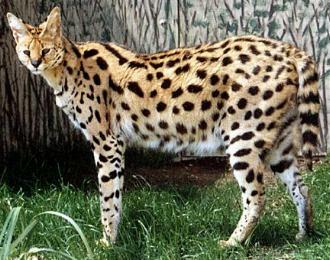 The overall agile body and long, muscular legs make the Serval one of the fastest and most nimble predators in Africa, and most of the hunting is done at lightning speed, as the cat has less endurance than its relatives. The colouration of this cat varies from almost white to yellowish brown, with many darker spots, and a whiter underside. 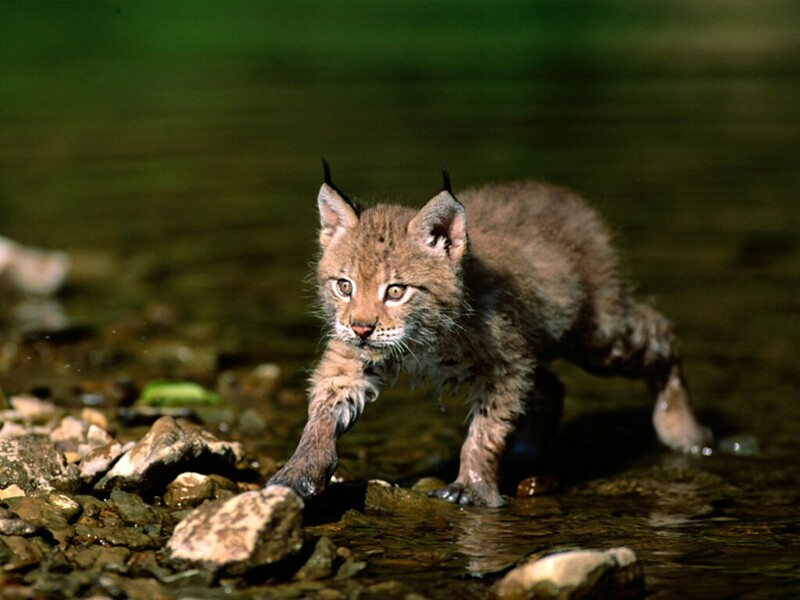 As many wild cats, they have long, flat ears that provide excellent hearing. These predators lead solitary lives and are also highly territorial and they don’t allow other specimen in their territory, marking it with urine. After finding a suited territory, the Serval stays there for many years, and may become quite violent if other members of their kin show interest in moving to the area. The Serval can climb trees, is an excellent swimmer, and can jump as much as 3 metres high, which make this animal an exceptional hunter. The Serval usually hunts at dusk or at night. Every night, the cat measures a distance of about 4 kilometres, looking for prey. Although most of the diet is composed of rodents, Servals also hunt birds, frogs, lizards. The size of the prey varies from small antelopes to even termites and locusts. 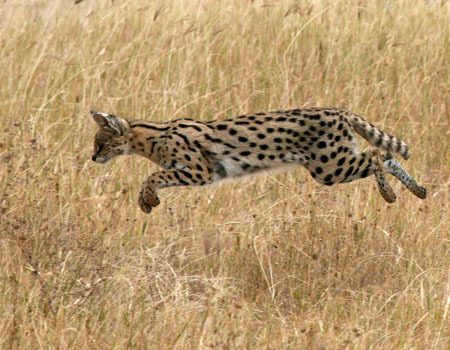 Serval has multiple hunting techniques, although most of them are centered around ambushing the victim and surprising it with a swift attack. The cat’s plumage provides excellent camouflage and they’re almost impossible to see in tall grass or bushes. The time of the mating period depends on the area inhabited. In some areas, females give birth twice a year. The otherwise solitary Servals meet other individuals only during this period and what’s interesting – the female is the one that looks for males, not the other way round. Soon after copulation, the couple parts and the female is left alone with the kits. After a gestation period of 2.5-3 months, one to four completely defenseless kits are born. The mother feeds them for about seven months and after that stay with the mother for a few months, until they are driven out. Unfortunately, because of their beautiful fur, Servals are widely hunted and poaching has caused a great damage to their population. Appropriate actions, however, have been taken and now the Serval is a protected animal, and their number seems to be stable at the moment. If you don’t want me to use it then just e-mail me and tell me to take it down.